In Part One we looked at how solar radiation and DLR (or “back radiation”) were absorbed by the ocean. And we had a brief look at how little heat would move by conduction into the deeper ocean if the ocean was “still”. There were some excellent comments in part one from Nick Stokes, Arthur Smith and Willis Eschenbach – probably others as well – take a look if you didn’t see them first time around. We will shortly look at mixing and convection, but first we will consider some absolute basics. Now, many people are confused about how temperatures change with heat imbalances. If, for some reason, more heat is absorbed by a system than is radiated/conducted/convected away – what happens? More heat absorbed than lost = heat gained. Heat gained leads to an increase of temperature (see note 1). When the temperature of a body increases, it radiates, conducts and convects more heat away (see note 2). Eventually a new equilibrium is reached at a higher temperature. It is important to grasp this concept. Read it again if it isn’t quite clear. Ask a question for clarification.. Evaluating a very simple energy balance model might help to set the scene. The primary question – the raison d’êtra for this article – is what happens if only the solar radiation heats the ocean? And compared with if the back-radiation also heats the ocean? It’s easy to find the basic equilibrium point using the first law of thermodynamics. All you need to know is the energy in, and the equation which links energy radiated with temperature. Notice the difference in the temperature trends for the two cases. Now the model doesn’t yet include convective heat transfer from the ocean to the atmosphere (or movement of heat from the tropics to the poles), which is why in the first graph the temperature gets so high. Convection will reduce this temperature to a more “real world” value. The second graph has only solar radiation heating the ocean. Notice that the temperature drops to a very low value (-15°C) in just a few years. Clearly the climate would be very different if this was the case, and the people who advocate this model need to explain exactly how the ocean temperature manages to stay so much higher. By the way, if we made the “well-mixed layer”, dmixed, of the ocean deeper it would increase the time for the temperature to change by any given amount. That’s because more ocean has more heat capacity. But it doesn’t change the fact of the energy imbalance, or the final equilibrium temperature. The model is a very simplistic one. That’s all you need to demonstrate that DLR, or “back radiation” must be absorbed by the ocean and contributing to the ocean heat content. This model is not going to revolutionize climate models as it has many simplifications. The important factor – there is no convection between different ocean layers in this model. Now conductivity in still water is very low (as explained in Part One). The starting condition – the “boundary condition” – was for the temperature to start at 300K (27°C) for the first 100m, with the ocean depths below to be a constant 1°C. You can see that the day/night variation of the top 1mm and 10cm are significant. Look back at the first graph which covers four years. Notice the purple line, 10m depth, the blue line, 3m depth; and the red line, 1m depth. Why is the ocean 1-10m depth increasing to such a high temperature? If these were the only mechanisms for transferring heat, the ocean 1m – 10m deep would be extremely hot in the tropics. This is because the ocean where the radiation is absorbed cannot radiate back out. For a mental picture think of a large thick slab of PVC which is heated from electrical elements within the PVC. Because it is such a poor conductor of heat, the inner temperature will rise much higher than the surface temperature, so long as the heating continues.. The reason this doesn’t happen in practice in the ocean is due to convection. If you heat a gas or liquid from below it heats up and expands. Because it is now less dense than the layer above it will rise. This is what happens in the atmosphere, and it also happens in the ocean. The ocean under the very surface layer heats up, expands and rises – overturning the top layer of the ocean. This is natural convection. The other effect that takes place is forced convection as the wind speed “stirs” the top few meters of the ocean. Convection is the transfer of heat by bulk motion of a fluid. Essentially, the gas or liquid moves, taking heat with it. Under summer heating conditions with vanishing wind, the trapping depth of the thermal response is only about 1m (mean depth value), and the surface amplitude is as large as 2ºC or 3ºC. 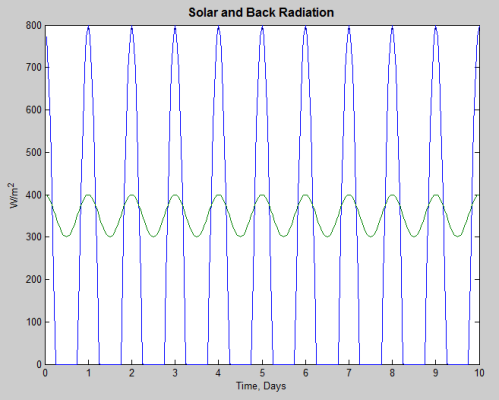 But, more commonly, when light or moderate winds are present, solar heating is wind mixed vertically to a considerably greater depth than is reached directly by radiation: the trapping depth is typically 10m, and the surface amplitude is reduced in inverse proportion to typically 0.2ºC. Given that the surface heating and wind stress are known, then the key to understanding and forecasting the diurnal cycle of the ocean is to learn how the trapping depth is set by the competing effects of a stabilizing surface heat flux and a destabilizing surface stress. Here are the results from a model with another slight improvement. This includes natural convection. The mechanism is very rudimentary at this stage. It simply analyzes the temperature profile at each time step and if the temperature is inverted from normal buoyancy a much higher value of thermal conductivity is used to simulate convection. The “bumpiness” you see in the temperature profile is because the model has multiple “slabs”, each with an average temperature. This could be reduced by a finer vertical grid. During the early afternoon with peak solar radiation, the ocean becomes stratified. Why? Because lots of heat is being absorbed in the first few meters with some then transported upwards to the surface via convection – but while the solar radiation value is high this heat keeps “pouring in” lower down. However, once the sun sets the surface will cool via radiation to the atmosphere and so become less buoyant. With no solar radiation now being absorbed lower down, the top few meters completely mix – from natural convection. I did have a paper with a perfect set of measurements to illustrate these points. It showed day/night and seasonal variation. Sadly I put it down somewhere. Many hours of hunting for the physical paper and for the file on my PC but it is still lost.. Note that the large variation of surface temperature (4-5°C) is just a result of the convective mixing element in the model being too simplistic and moving heat much faster than happens in reality. In the upper part of the ocean, a mixed layer with homogeneous density (or nearly homogeneous temperature) distribution is formed during the night due to free convection associated with heat loss from the sea surface and to forced convection by wind mixing. 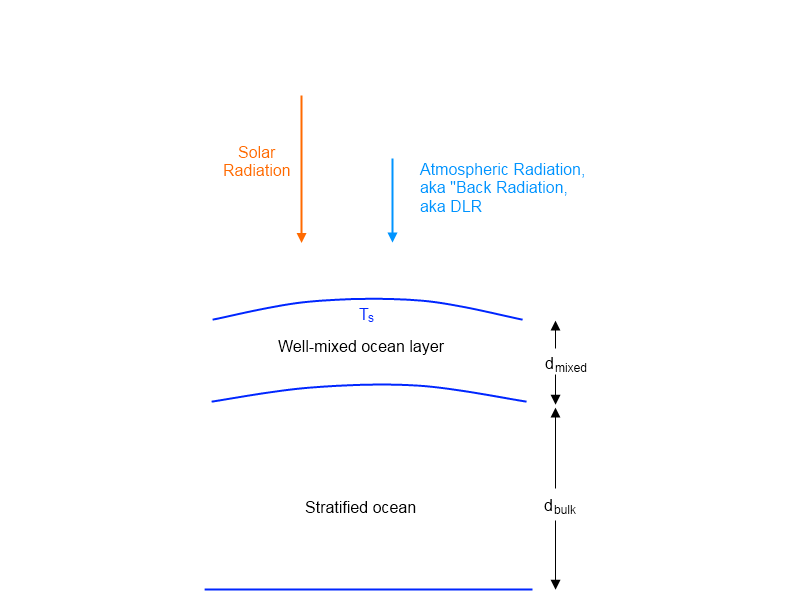 During the daytime, the absorption of solar radiation which occurs mostly near the sea surface causes the temperature to rise, and a stable layer is formed there; as a consequence, turbulent transport is reduced. Daily mean depth of the mixed layer increases with the wind speed. When the wind speed is lower than about 7-8 m/s, the mixed layer disappears about noon but it develops again in the later afternoon. A mixed layer can be sustained all day under high wind speeds.. The subject of convection and oceans is a fascinating one and I hope to cover much more. However, convection is a complex subject, the most complex mechanism of heat transfer “by a mile”. There are also some complexities with the skin layer of the ocean which are worth taking a closer look at in a future article. This article uses some very simple models to demonstrate that energy radiated from the atmosphere is being absorbed in the ocean surface and affecting its temperature. If it wasn’t the ocean surface would freeze. Therefore, if atmospheric radiation increases (for example, from an increase in “greenhouse” gases), then, all other things being equal, this will increase the ocean temperature. The models also demonstrate that conduction of heat on its own cannot explain the temperature profiles we see in the ocean. Natural convection and wind speed both create convection, which is a much more effective heat transport mechanism in gases and liquids than conduction. Note 1 – For the purists, heat retained can go into chemical energy, it can go into mechanisms like melting ice, or evaporating water which don’t immediately increase temperature. Note 2 – For the purists, the actual heat transfer mechanism depends on the physical circumstances. For example, in a vacuum, only radiation can transfer heat. Also, Minnett (2010) “Measurements of the oceanic thermal skin effect”, Deep-Sea Research II. Just one problem about your conjectures here, despite the nice graphs, colour and all. You should try to get your head around two simple experiments and ponder over the consequences. a, That the heating effect of a glasshouse is due to trapping the air. b, That the radiative effects of the Earth Surface/Atmosphere interactions are almost negligible for the purposes of the experiment. Think hard about point b. Obtain a parabolic reflector (or Gords solar heater) point it up at the clear night sky. Place a sample of water (above the ambient air temperature) at the focus of the reflector. With a thermometer in the water you can check what happens. The temperature of the water will drop and in the right conditions you will produce ice even though the ambient air temperature is above zero celsius. So does Back-Radiation “Heat” the Ocean? This ‘Gord’ experiment wasn’t an ‘experiment’ despite your insistence that it was. How about dealing with reality? 1. Only in the most primitive of explanations to an uneducated audience is the likening of GHGs to a greenhouse used. Everyone in this audience knows that is a grossly oversimplified explanation of the real world. Wood’s experiment, flawed as it was, is simply not pertinent to the discussion. 2. Parabolic reflectors work because the rays coming in parallel to each other are reflected to the focal point of the parabola. The sun’s rays come in nearly parallel to each other and so the reflector does it’s job nicely. Infrared coming from the surrounding atmosphere come from a hemisphere of angles. There’s no reason to expect that it will have any effect at night. Neither of the talking points you’ve brought to the discussion is pertinent. I’m starting to get the impression that you are good at manipulating symbols, but suffer a disconnect when it comes on what they mean in the physical world. ……”1. Only in the most primitive of explanations to an uneducated audience is the likening of GHGs to a greenhouse used. “……. Yes I think almost everyone now knows that a real glasshouse works because it traps the conductive then convectively heated air. What many people don’t appreciate that the radiative effect inside a greenhouse is so small it can be effectively ignored. So how this tiny residual effect produces a 33C rise in the planets temperature is something of a mystery, only confided to the IPCC. Yes of course all parallel rays will focus perfectly at the focal point. However the parabolic reflector will have some kind of reduced focusing effect. There are many examples of such effects. How would you explain ice forming at the focus of the reflector when the ambient temperature is above zero? So do you think that the first law of thermodynamics is flawed or the Stefan-Boltzmann equation? Did you see the previous question? We start with what experimental evidence tells us. We then can construct theories. Only theories that correspond and do not contradict our observations are worth the paper they are printed on. The Stefan-Boltzmann law and the First Law of Thermodynamics have been well-proven by experiments over 150 years. Earlier you appeared to endorse a textbook which covers these basics. Strictly speaking, that textbook just assumes the first law of thermodynamics, but it definitely endorses the Stefan-Boltzmann law. Perhaps you actually think the textbook is all made up? If you believe something is false, come out and say it. I have explained in simple terms how the first law of thermodynamics and the Stefan-Boltzmann law lead to an inevitable conclusion about ocean heat and atmospheric radiation. It would appear that one of these premises must be wrong, or the conclusion will be confirmed. So if an experiment that you hold dear refutes one of these, please explain which one you think it refutes. I know that you are not able to do this. I came up with two simple experiments that indicates that it does not. Perhaps you now agree with me then since you don’t appear to want to defend your posting. Moving on to another topic when this ones hardly started is not to way to resolve questions. Being all the fields inseparable, we do not realize how important are overlooked things like: orbit eccentricity, gravity acceleration, magnetic/electrical fields. Post normal science may argue many things, however it overlooks simple and inmediate facts as the same forces which make our hearts within our chests to be inclined in a certain and defined angle, act all over around us and we ignore them. ….but, we want everyone to know we are so “intelligent”, so “wise”, so “cool”, that we have ignored, that, from more than two thousand years, the pythagorean “Tetraktis”, expressed in the simpler terms possible what we can´t with supercomputers and self conceited complicated mathematics (while trying to hide the fact that those same super computers, make its calculations by using the most simple of arithmetics). This article is so riddled with unaddressed assumptions I don’t know where to start. Well, actually I do. Start with the empirical data from experiments. That’s what the scientific method advocates anyway. ScienceOfDoom, thanks for another interesting exposition. It fits with my experience … and I have lots. Of course DLR (downwelling longwave radiation) heats (that is to say adds energy to) whatever it hits, including the ocean. Infrared radiation heats whatever it hits, we know that from our daily experience. Step into a room heated by a wood stove. Even with your eyes closed you can tell where the stove is. How? Longwave radiation, invisible to the eye, is emitted by the stove and is immediately felt on the skin. As you know, it goes both ways. You are radiating at all times, just like the stove. And so you warm the things around you by radiation. Counter-intuitively, you just radiate, and your radiation strikes and heats (adds energy to) whatever it strikes … including the stove. In fact the stove is warmed by everything around it, not just by you … which doesn’t change the fact that the net flow always has to go from warmer to colder. One source of misunderstanding involves the word “heats”. I understand that as meaning “adds energy to”. If the object is cooling, the added energy may only slow the rate of cooling. And yes, as you show, DLR is a large source of energy. Total downwelling energy absorbed at the earth’s surface, in all forms, is about half a kilowatt per square metre. Of that, the sun provides about a third (170 watts), and longwave radiation from all sources (clouds, GHGs, and aerosols) provides about two thirds. …..”Step into a room heated by a wood stove”….. In SoDs definition you are therefor heating the stove by radiating to it. Now you may say that we can define heat in that way and of course in a free country you can. However this leads to confusion if you are communicating with someone using the accepted Physics definition of HEAT as being the NET result of the thermal energy interaction. Heat defined in the proper way fits in with its thermodynamic capacity to do work. Heat defined in the proper way also fits in with the well known summation of the 2nd law of TD. Heat always flows from a hot body to a cooler body never the reverse. I think that communicating in a world where folk freely change the meaning of keywords like Mass Weight Work Heat and Force will become needlessly complicated and should be discouraged. You propose a story that has no experimental evidence. I do a very simple analysis so that everyone can see that the story must be flawed and you say “go do an experiment”. In fact, I am using numbers from experiments. I don’t think you understand the scientific method because once you have done lots of experiments you can apply those results to new problems. That is what I have done here. You should present your evidence for your story. Or your calculations (which also count as evidence) for your story. In fact, there is a large body of experiments on ocean heat budgets. When I present them you can then question the many more assumptions and relationships which are needed to complete an ocean heat budget. Water has a very high specific heat capacity, which means it takes a lot of energy or time to heat it up. Allowing for all of the ocean heat terms is a much more complex exercise involving many more measurements and empirical relationships. So many experiments have been done – in the end, they attempt to add up all the terms and demonstrate that they have “closed the budget” and, therefore, have a fuller understanding of all of the heat flows. The result is a more complex exercise with lots of other papers referenced. At some point in these very detailed papers, people add up the numbers to find out if they are close or way off. We don’t need to do a complex study to determine that your analysis is wrong. We just need to understand that energy cannot be created or destroyed along with the value for incident radiation at the ocean surface and radiation emitted from the ocean surface. Go ahead and list the assumptions that you believe are incorrect or should be questioned and we can have a scientific discussion. I think the main point of disagreement between us is that you think the downwelling longwave radiation heats the bulk of the ocean. It doesn’t, because it can’t penetrate beyond its own wavelength and the surface doesn’t mix down as much as you seem to think it does. This is because wave action, according to the experiments I’m aware of, mixes down eddies which form much deeper down in the waves than downwelling IR can get to (~0.06mm). I’ve raised this point before, but you never address it, so I’ll keep repeating it until you do. The downwelling radiation from the atmosphere hits the sea surface and is pretty much immediately re-emitted upwards. So yes, the ocean is emitting lots of IR, but no, the bulk of the ocean isn’t getting heated by it, because there is no mechanism (including your upside down ‘convection’) which will do the job. It goes upwards because that’s the easiest path for it to go. I think you should be able to see that if you think about it for a minute. According to papers I’ve read produced by the oceanography dept at Southampton University in the UK, the budget fails to close by around 30W/m^2. More work to do here, obviously. The Sun heats the ocean, the ocean heats the atmosphere, the atmosphere traps some of the heat for a while, bounces it back off the ocean surface, then loses it to space. If instead you want to say that the increased co2 level slows the rate of cooling of the ocean, you need to demonstrate that nothing else has changed to offset it. At the moment this is the big hidden assumption in your reasoning. The empirical evidence, imperfect though it may be, shows that humidity was falling for most of the latter C20th. Is that true? I thought the Dessler and Davis reanalysis found something different. You posted a 100 year old paper about measurements in a greenhouse. I haven’t read it yet. 1. Does a hotter body absorb radiation from a colder body. I can find many answers from you from including “no”, “a little”, “possibly more”. So why not actually state your opinion? I believe, and have stated many times, that absorptivity of a body is an inherent property of the material, which is a function of wavelength and direction. This is in all the textbooks and is uncontroversial within the frame of normal physics. 2. Is this equation true: ΔT = ΔQ/mc, where ΔT=change in temperature, ΔQ = change in energy, m = mass and c = specific heat capacity. I believe and have stated that it doesn’t matter where the ΔQ came from. That is why the equation does not have a term for where the ΔQ came from. This is also in all the textbooks and is uncontroversial. I look forward to your clear and precise answers. ….”2. Is this equation true: ΔT = ΔQ/mc, where ΔT=change in temperature, ΔQ = change in energy, m = mass and c = specific heat capacity. I believe and have stated that it doesn’t matter where the ΔQ came from.”……. The simple equation you use is derived from the 1st Law of TD (conservation of energy). A typical example of the use of this equation would be to work out how long it would take an electric kettle to raise the temperature of a mass of water say by 60c. PxT = CMdT with the usual meaning for the symbols. The assumption here is that all the electric energy (highest quality) is used to raise the temperature of the water with no heat loss. What you want to do with the equation is to use it for a situation forbidden by the 2nd Law. You want (say) radiation of 200J from an object at say 100K to raise the temperature of an object at 500K. To do so the radiation would have to be upconverted to radiation characteristic of 500K plus. To illustrate this point lets say that the heat energy gained above was then used in some thermoelectric device. Do you think it would produce exactly the same(original) electrical energy output? You seem to have a basic flaw with the idea that X joules of radiant energy at say 15um is exactly thermodynamically equivalent X joules of radiant energy of 1um photons. This ignores the fact that the 1um photons are energy of a higher quality than the 15um photons. This means that the 1um photons could be utilised for energy transformations that the 15um radiation is just not capable of. I would suggest that you read it immediately. It only takes 5 minutes, G&T include it in their paper which you claim to have read. It is now generally accepted on all sides as being physically correct. If true it makes much of what you write science fiction. The mechanism by which a greenhouse warms is irrelevant to climate science. Everyone acknowledges that the term “greenhouse effect” is misleading and doesn’t accurately describe the DLR mechanism. Your suggestion that a solar collector doesn’t concentrate DLR at nighttime may be interesting, but the reflector would need to be made of materials that actually reflect IR, not visible light. If you believe that the surface of the ocean absorbs atmospheric radiation and then emits this radiation – we are mostly in agreement in this point. This article tests the idea that “back radiation” is absorbed and then immediately consumed in evaporating the surface of the ocean. If that is the case, then the surface will cool down very quickly. Because it will radiate according to its temperature. If the back radiation is consumed in evaporating the surface layer where is this energy to now radiate coming from? If that is not the case then the surface will be affected by the amount of back radiation. My “upside down” convection is very simple and standard ocean physics. When the surface cools, the ocean at the surface becomes more dense and sinks. The temperature contours become “compressed” in the top few meters at night. Why? Because the ocean has become well-mixed. The same happens in higher winds – the ocean becomes well-mixed. There is nothing particularly mysterious or unphysical about this. But in a followup article I will cover this in more detail. If instead you want to say that the increased co2 level slows the rate of cooling of the ocean, you need to demonstrate that nothing else has changed to offset it. At the moment this is the big hidden assumption in your reasoning. No, I am commenting at a much more basic level. Climate is very complex, something I have expressed many times on this blog. “All other things being equal”, more CO2 means a warmer surface. This is relatively simple (although requires an understanding of radiative physics). I believe that the reductionist approach to science works well. If we understand the basics, we have a chance of understanding more complex problems. If we don’t understand the basics then there is no hope for more complex problems. The energy that the sun is inserting into the ocean eventually has to leave the ocean. How does it do this? Either by conduction out of the surface, or by evaporation of the surface, or by IR emitted by the surface. The rate at which this happens is going to be a function of the difference in temperature between the surface and the layer at which energy is being input. The energy of back-radiation is also being input into the surface. Therefore, the surface is (even if only very briefly) warmer than it would otherwise be, which will slow the rate at which the deeper-water’s energy can be transferred to the surface. It isn’t like back-radiation is a magic wand that creates surface evaporation: surface evaporation is happening all the time, even in the presence of a liquid-nitrogen cooled metal plate suspended over the water in order to decrease that phenomena – look up “partial pressure of water” or “vapor pressure”. We have two separate totally vacuum chambers (A and B), each a 10 foot cube. Each contains a steel ball of roughly identical size at 300K. Chamber B, however, also contains an aluminum ball at 100K. Will the steel ball in chamber B cool less quickly than the steel ball in chamber A (the environments exterior to the chambers being equal)? And if radiation from the steel ball in chamber B heats up the aluminum ball, will the aluminum ball stop absorbing the radiation from the steel ball when the balls’ temperatures equate? According to your physics, the steel balls in both chambers would cool identically. Indeed, according to your physics, the steel ball in B could be surrounded (but still with the non-conductive vacuum layer in between) by any cooler substance and not cool any differently than the ball in A. Also, you say “You want (say) radiation of 200J from an object at say 100K to raise the temperature of an object at 500K” (emphasis mine). I don’t think that’s what SoD is claiming. The net effect would not be positive, and so no “raising” would take place. Objects are always radiating. If the 500K object were to suddenly, miraculously, impossibly stop radiating, then the 100K object would indeed add energy to the 500K object. I will try and explain the subject. But by extension, a change in distribution of energy in the oceans, can “heat” the oceans, by the simple fact that its not just moving the energy, but changing the atmospheric properties above it through evaporation/humidity/heating of the atmosphere… How do you untangle cause vrs effect here? Im guessing you are heading in this direction, with these series o posts on Ocean/atmosphere /THC etc. Might be jumping ahead a bit. Bryan – as far as I can see, your experiment is simply stating the rather well-known fact that the “greenhouse effect” is very badly named. This in no ways invalidates any the experimental data on the real greenhouse effect. I’m sorry but I don’t understand this sentence. Back radiation arrives, is totally absorbed in the latent heat from converting water to water vapor. (According to “the story” that I am disputing). Now the surface must follow Stefan-Boltzmann’s law for radiation and radiate something like 400 W/m^2. Where does the energy for the 400 W/m^2 come from if all of the back radiation is used up in evaporating water? If that much energy leaves the surface of the water and no energy is arriving to replace it, the water will cool down. The cooled down water becomes more dense, sinks, and is replaced by the less dense, more buoyant water which is radiating the 400W/m^2 when it arrives at the surface. This is the process properly called convection. And so now refer to the first two graphs in the article – these are simply modeling in time the fact that solar radiation on its own cannot account for the radiation emitted from the surface of the ocean. The first law of thermodynamics says that – therefore – the ocean will cool down substantially from its current temperature. Situation of radiation from cold object arriving at warmer object. The cold object becomes the “source” for the warmer object. We know that an irradiated surface cannot be heated higher than the “source” temperature i.e. 100K – but its already at 500K! 20J(say) from the “source” with longer wavelengths characteristic of 100K cannot be converted to 20J of shorter wavelengths characteristic of 500K without coming into conflict with the 2nd Law of TD. No experimental evidence has ever been provided to support the idea that the warmer surface increases its temperature. Heat only flows from higher temperature object to a lower temperature object – never the reverse. Woods experiment shows that the radiative interaction between the atmosphere and the Earth surface is very small. Yet some say the “real greenhouse effect” causes the surface of the planet temperature to be 33K higher because of the “greenhouse” gases. I dont think you can fully discuss ocean “heating” without at least covering the ocean skin and why it is as it is. You’re forgetting the radiation emitted by the hot and active water vapour molecules which are being evaporated by the ‘back radiation’. You need to include that too. The radiation that goes to any significant depth in the ocean is solar shortwave energy. The radiation coming off the ocean/atmosphere boundary layer is that solar energy converted to LW plus the almost immediately re-emitted ‘back radiation’ which can only get ~0.006mm into the ocean. This is well known and understood physics. Water is opaque to LW radiation. That’s why the ocean is emitting more LW than what is coming down from the atmosphere as ‘back radiation’. This re-emitted back radiation, will it be slowing the convective export of energy to the surface layer from below, by the simple fact that it is going to be raising the energy level of the surface layer? What SOD is demonstrating, is that if you limit the lose of energy at the boundary layer of the atmosphere/ocean surface, it will result in a gain of energy retained in the oceans… i agree it is solar energy that is heating the oceans, but back radiation is limiting the amount of energy moved from below the surface to the surface and then to the atmosphere, by the simple fact that it is increasing the energy in this layer, slowing the rate at which it looses energy(and then sinks/ conducts energy from below the surface), the back radiation being a product of the T of the atmosphere, also means that it will be limiting conductive/convective looses at the same time o course. No surprises here, “heat” only flows from hotter to colder 😉 , but the differential in temperature sets the rate at which energy can be moved across a boundary. The exception being radiation, which has the ability o passing straight through some mediums without interacting, the mediums properties dependent. Which story are you standing up for? I have said – and you appear to dispute it – that back radiation from the atmosphere is necessarily absorbed and re-radiated. I have explained that this must be so or the ocean would cool down until radiation matched only the solar input. A much cooler ocean would result. You are now “disputing my claim” by saying a major source of energy for emission of radiation by the ocean surface is back radiation from the atmosphere.. But that is my claim. You are now “disputing my claim” by saying a major source of energy for emission of radiation by the ocean surface is back radiation from the atmosphere.. But that is my claim. No. Your claim is that back radiation can heat the ocean. I’m saying there is no mechanism which accomplishes this. Radiation fails because water is opaque at the wavelengths of ‘back radiation’. Convection fails because it doesn’t work upside down. Mechanical stirring fails because the eddies formed within wave structures are far below the depth ‘back radiation’ penetrates to. Also working against the idea is the fact that hotter stuff rises in general, the latent heat of evaporation cools the surface it leaves behind, and since the ocean surface is in general warmer than the air above it, the heat-energy contained in evaporated water vapour goes up up and away. So in summary, I don’t have a problem with the ocean surface (~0.006mm) absorbing and re-emitting ‘back radiation’. I do have a problem with your idea that it can heat the ocean bulk in any significant way. I’ve said this all along, and your first graph showing ‘solar only’ is therefore a rhetorical trick to set up a straw man argument which you can knock down. TB, I really can’t see how this is difficult. The sea receives average 235 W/m2 sunlight. It penetrates, but the sea is in steady state, and there’s nowhere downward for the heat to go. It returns through the surface. It must be radiated from the skin. How do you think it gets there? The skin is warmer than the depths. At an average 12C, the sea must radiate about 375 W/m2. Only 235 available from below. Where do you think the rest comes from? If it wasn’t coming from above the sea would have to cool. In fact, freeze. There is a significant difference in process between LW heating the ocean which you’ve specifically mentioned and “bouncing off” the ocean which appears to be the actual process. If it was heating the surface then the surface temperature must increase. Peter Minnett measured this in the experiment from the first comment. If the “bouncing” LW component forms part of the total LW radiation that the ocean must be radiating then firsly thats a significant part of the discussion and secondly you also need to look at evaporation that also takes place at the interface to have a complete picture. There is a significant difference in process between LW heating the ocean which you’ve specifically mentioned and “bouncing off” the ocean which appears to be the actual process..
Energy is either reflected, absorbed or transmitted. Given that the ocean is very deep transmission is zero. The absorptivity of the ocean to longwave radiation is very high. The other way of saying that is the reflectivity is very low. Reflectivity is almost zero for longwave radiation. If it was heating the surface then the surface temperature must increase. Peter Minnett measured this in the experiment from the first comment.. If it is being absorbed it contributes to the energy balance. If it is not absorbed (for example, if the reflectivity was very high) then it doesn’t contribute to the energy balance. (where ΔT = change in temperature, m = mass and c = specific heat capacity) Energy reflected does not come into this equation. If the “bouncing” LW component forms part of the total LW radiation that the ocean must be radiating then firsly thats a significant part of the discussion.. Reflected radiation is irrelevant in the calculation of j = εσT^4. A surface radiates based on its temperature and irrespective of the incident radiation. For the sake of completeness, the exception is in the case of irradiation so high that LTE no longer applies – see Planck, Stefan-Boltzmann, Kirchhoff and LTE, but would be unlike any normal condition. Clearly I shouldn’t have used “bouncing off” as a term because even though I quoted it to signify that it wasn’t literally bouncing off you apear to have interpreted it that way anyway. So all your comment is irrelevent as far as I can tell. Replace “bouncing off” with “absorbed within the to 10um of the ocean (as opposed to the bulk) and then re-radiated” if it helps you understand my point. Your point still isn’t clear. The ocean doesn’t automatically radiate the energy it receives from the atmosphere. It radiates according to the equation j = εσT^4. So, for example, if the ocean temperature is 20’C it radiates at 415 W/m² – regardless of whether the back radiation at the time is 200 W/m² or 400 W/m². The value of the back radiation being absorbed along with the other heat flows to the surface will dictate whether the ocean surface is cooling or heating. ..and secondly you also need to look at evaporation that also takes place at the interface to have a complete picture. Of course. This article is attempting to deal with a specific and easy to understand point. Any paper that attempts to calculate the heat budget for the ocean surface or top layer (and there are many) include a term for latent heat removal, as well as all other heat transfer terms. Perhaps you can explain again what point you are trying to make. After all, this article claims that back radiation is absorbed by the ocean surface and then re-radiated. The ocean doesn’t really “absorb” the LW downward radiation either so to say it heats the “ocean” is misleading. At best it heats the topmost molecules. That heating then is re-radiated and increases evaporation. This is the physical effect at the ocean surface not that of heating the ocean which is what you’ve implied I think and Its an important distinction to be making when discussing ocean heating. The point about radiation is, as you say, the ocean radiates according to j = εσT^4 and that will be made up of some of the heat re-radiated from the LW downward radiation (the energy not used for evaporation or the tiny amount mixed down) plus heat from the bulk. So to understand ocean heating we need to understand how those two relate, how they change and what effect the evaporation has too. I feel your discussion is lacking in its explanation by ignoring the detail. This “heat” in quotes is a bit o tongue in cheek humor… and if you had endured the “2nd law wars” that have been raging here, it would probably make you grin, as it does me. But the point of this article is, that with the ocean, the amount of back radiation, will limit the amount of energy able to be moved from below the surface, to the surface, then into the atmosphere… The fact that its opaque to LW, is the reason why energy can only be moved into the atmosphere from the surface. So if you increase the amount of back radiation you will increase the amount the surface absorbs, which is going to decrease the amount that can be moved from below the surface to the surface… simple. And if you have the same amount of energy going into the oceans from the sun, you are going to get an increase in the total energy contained in the oceans. This article is just explaining, how radiative transfer between the atmosphere and ocean surface directly effect how much energy can be moved into the atmosphere. No doubt, if you increase the surface T you increase evaporation/ increase latent heat transport/ change salinity and densities of ocean water etc. But the basic reason why radiative exchange limits energy loses from the ocean into the atmosphere, is fundamental in understanding how the others relate… they are dependent on this. This article is just explaining, how radiative transfer between the atmosphere and ocean surface directly effect how much energy can be moved into the atmosphere. No doubt, if you increase the surface T you increase evaporation/ increase latent heat transport/ change salinity and densities of ocean water etc. The devil is in the etc. This article doesn’t explain any of that, it sets up a sideshow dichotomy of ‘solar only’ and ‘solar plus back radiation’ and thus conflates the two different types of energy, and their effect on the ocean. The sun warms the ocean bulk by penetrating tens of meters into it. LW does not. You claim increased LW ‘limits the emission rate’, yet the empirical evidence is that ocean heat content has been declining for seven years while co2 has increased. So what is happening? Has humidity declined while co2 and surface temperature has risen? Does the contraction of the ionosphere due to the quiescent sun cause more energy to escape to space from the top of the atmosphere? Do we have a good enough handle on the causes of the variables to be sure negative feedbacks don’t automagically compensate for changes in co2? Textbook theory is all very well and good, but taking a look at empirical reality once in a while helps understanding too. It tells us we don’t know enough to make attribution certain. It’s not my intention to misrepresent your point of view to claim easy points. When I first presented what I understood of “the story” on your blog you didn’t say “no, that’s not my point”. Well, that’s not how I heard it anyway. And I have seen many people on a very popular blog frequently claim, without evidence, that back radiation simply causes evaporation.. and, therefore, more back radiation will simply cause more evaporation. It appears you have a different point of view that I didn’t quite grasp and I apologize for misunderstanding it. ..yet the empirical evidence is that ocean heat content has been declining for seven years while co2 has increased.. I haven’t proposed some simple relationship between the two. If others have then good luck to them. What I am trying to do in this article, and many others like it, is to explain and disentangle simple relationships. Climate is very complex, but that doesn’t mean we can’t use well-known physics to prove or disprove specific ideas. Thank you for this courteous reply. Likewise, my apologies if your intention is merely to elucidate ‘simple relationships’ rather than try to give the impression that back radiation must heat the bulk of the ocean or it would freeze. They say Engineering is applied science. As a trained engineer with a degree level qualification in mechanical science, I studied pyrology and fluid dynamics and as well as gaining theoretical knowledge about these subjects I learned about their practical application working on the factory shop floor, for example using big hot salt baths to temper metals and remachining pump casings which had become eroded due to cavitation effects in high pressure salt water flows. One of the lessons I learned was that theoretical values never match real world measurements. Later, I did a degree in the history and philosophy of science. One of the important things I learned was that a lot of scientists never get a deep appreciation of that simple fact, because these days they work with computer simulations a lot more than with world worn equipment. The real world is itself world worn, and accreted with all sorts of biological stuff which affects the nice clean energy theory we attempt to apply to it. Living matter is very clever at leaching energy out of the environment. In trying to disentagle ‘simple relationships’ we discover that nothing in the real world is simple. In our discussion, we haven’t touched on these other factors which affect the physics of the ocean air interface; marine biota, turbidity, overturning forces, magnetism etc etc. This is why I don’t quote many numbers and simple equations in these discussions. It lends a form of ‘false precision’ to the debate. You are right that we have to start somewhere to get a handle on climate. As far as I see it, that somewhere is by prefacing all our hypothesising with an affirmation of our awareness of the uncertainty of the ground we buld on, and the lack of knowledge we have concerning the magnitude of the effects of difficult to quantify factors. That said, a lot of progress has been made in at least better defining the problem, even if we don’t yet have the answers. This makes me hopeful for the future of the scientific enterprise. This in no way contradicts the fact that atmospheric downward LW limits the energy moved from within the ocean, to the surface, then into the atmosphere… if the oceans were frozen, that would be pretty conclusive proof that the atmosphere dosnt effect the movement of energy from the oceans up. So, the oceans are cooling, this could be because of increased cloud cover/reduced short wave? Increase in latitudinal export o energy, resulting in greater atmospheric loses at higher latitudes? Maybe a change in air circulation, moving colder higher latitude air masses to mid latitudes? Many possibilities, but it certainly in no way suggests that somehow the boundary conditions between the atmosphere/ocean dont effect the rate at which energy can be moved from the oceans up… It goes both ways, if you decrease atmospheric T’s, more energy will be moved from below the surface, to the surface, then into the atmosphere. And if you dont understand the simple mechanisms that cause these things, you have no way of interpreting the empirical observations. This thread is about simple energy transfer. That is all. And the fact that the oceans radiate more energy than they recieve from the sun, is proof that energy is being retained in the system. And it is a result of the fact, that the atmospheric T’s at the ocean/atmosphere boundary, limit the amount of net energy flow, from the surface up. Mike, I agree with pretty much all you’ve said. I just wish those scientists who are convinced an increase in atmospheric co2 must lead to dangerous warming also understood that the concert of possible mechanisms you’ve reiterated could be feedbacks which act to re-equilibriate temperature. Given that the Earth has been through epochs when the co2 level is estimated to have been 20 times higher than now (around five doublings from the pre-industrial-little ice age 270ppm) it seems pretty obvious to me that there are indeed negative feedbacks in operation. However, the non-linearity of climate sensitivity to co2 levels is a topic for another thread. As I see it, the big picture is that the sun warms the oceans, the oceans warm the atmosphere, the atmosphere affects but does not fully control the rate at which the oceans lose energy, and then loses energy to space. The sun is the climate driver, co2 is just another feedback. As Jim Lovelock said in his first book ‘Gaia: A new look at life on Earth’ the signature of a life bearing planet is to be seen in the negatively entropic makeup of it’s atmosphere. The micro-organisms responsible for an oxygen rich gaseous environment have been around for an extremely long time, and outweigh the entire human population in sheer tonnage terms by many orders of magnitude. You could stand the entire human population population on a 30 mile by 30 mile island. Consider the size of the kelp mass in the sargasso sea alone. So any small perturbation to the relative masses of atmospheric gases are easily handled by Earth’s biological skin. This is why an increase in co2 from 0.027% of the atmosphere to 0.039% doesn’t look like a big issue to me. Earth’s surface temperature tends to settle around one of two values, around 9C or around 22C. At the moment, we are near the lower value, with uninhabitable big deserts, polar ice-caps and geological-time low co2 values. In previous epochs, the Earth has been warmer, and covered from pole to pole in rich flora and fauna. If life is what we value, we should welcome an increase in co2. It might help stave off the coming ice age, for a while at least. 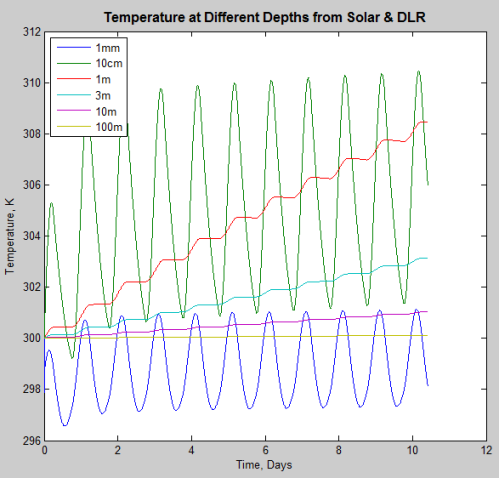 The question “Does DLR heat the ocean” can be answered from several points of view. 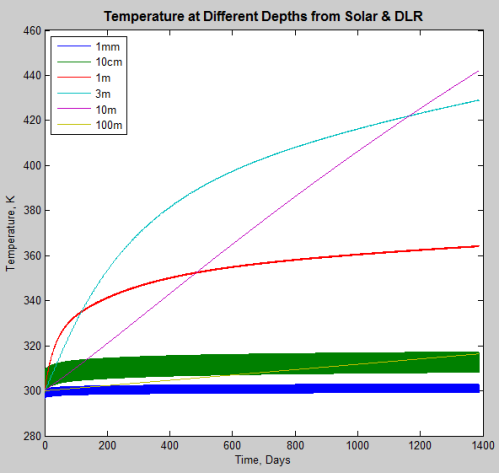 According to SOD’s graphs, DLR deposits 300-400 W/m^2 in the top 30 um of the tropical ocean. (The top 10 um gets about 90%, so I chose to talk about the top 30 um that gets 99.9% of the DLR.) At first glance, one might think that dumping all of this energy in a small volume will warm this thin layer and produce lots of evaporation. Before considering evaporation, however, one must account for the energy that is radiated upward from this thin layer of water. Assuming it acts as a blackbody at infrared wavelengths, a 27 degC tropical ocean radiates 460 W/m^2 – and that infrared radiation has to be emitted from exactly the same 30 um thick layer that absorbed the DLR. DLR makes the top 30 um of the ocean warmer than it would be without GHG’s in the atmosphere, but infrared is a net loser for the top 30 um. Infrared must be a net loser – heat flows from the warmer ocean to the cooler atmosphere and the optical properties of water demand that this flow comes from the top 30 um. Now that we have properly taken radiation into account, we can consider evaporation, a process that also cools only the top 30 um of the ocean. The ocean below the top 30 um doesn’t lose any appreciable energy by evaporation or infrared, so it is not surprising that the top 30 um is colder than deeper water in SOD’s graphs. Due to the net energy loss by infrared and evaporation mechanisms, the top 30 um of water would freeze if it didn’t get energy from somewhere. 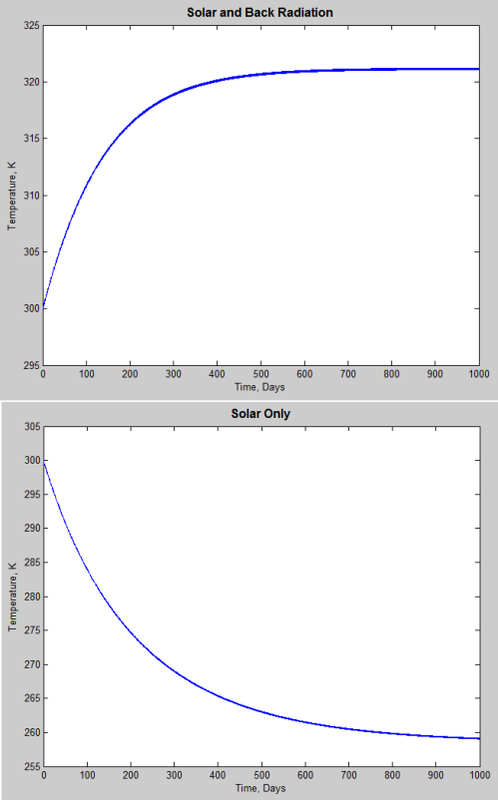 During the day, this layer can get energy from visible sunlight; the graph in Part One shows that about 20% of visible solar energy is absorbed in the top 30 um. About 1366 W/m^2 of sunlight is available from the sun at the top of the atmosphere in tropics at noon, but not all of this is reaches the surface even where it is not cloudy. At its peak, the sun provides about 200 W/m^2 to the top 30 um. At noon on a good day, DLR (typical maximum 400 W/m^2) plus solar (200 W/m^2) can provide the 460 W/m^2 the top 30 um must radiate, with an additional 140 W/m^2 to “fund” evaporation and rising water temperature. On the average, however, 350 W/m^2 from DLR and about 75 W/m^2 from the sun is not enough to compensate for outgoing radiation. (Why 75 W/m^2? The global average is about 50 W/m^2 (4*PI*R^2 vs PI*R^2), but the tropics gets more than average. Half of each 24 hours is dark and the sunlight comes at a steep angle during part of daylight, so 100 W/m^2 is too high.) Evaporation makes the energy deficit in the top 30 um even worse. When the top 30 um cools, it will be more dense and sink. It will be replaced by water that absorbed some sunlight, but didn’t have energy losses due to radiation or evaporation (until it reached the surface). So DLR warms the top 30 um of the ocean, but infrared is a net loser. The top 30 um is usually cooler than the water immediately below – which doesn’t receive appreciable DLR. If DLR doesn’t reach most of the ocean and the part it does reach is usually colder than water below, should we say that DLR warmed the ocean? Technically, SOD is correct – the ocean will freeze without DLR, so DLR warms the ocean. On the other hand, the top 30 uM of the ocean is cooled by infrared and by evaporation. Net ocean warming occurs AT VISIBLE WAVELENGTHS, below the top 30 um. Frank, interesting energy balance estimates, thanks. Do you have any extimate for the amount of energy coming into the oceans from below, through undersea volcanos and other ocean bed thermal vents, and what the variability of that figure might be throughout the interglacial epoch? Tallbloke, do the “interesting energy balances” convince you that the warming from DLR on the top 30 um of the ocean is more than off-set by radiative cooling of the same layer of the ocean? I should note that SOD probably did far more extensive and sophisticated calculations to create his graphs; mine as merely more transparent. I believe that 0.1W/m^2 figure is land based, where the crust is much thicker than the seabed is. What about the interface of water and air. The molecules striking and leaving the water will have a conductive interchange with the water molecules. Heat can be transferred between them going in the direction higher to lower temperature. It seems to be the preoccupation of some that the only heating mechanism is radiative. However you mention evaporation and convective mixing in your post so I don’t see how you can ignore conduction. Exactly at the air/water interface, conductive transfer must be included to give an overall picture of how heat can be transferred. @Frank, Maximum DLR occurs on cloudy humid days. DLR tends to reduce significantly on clear days. Tim: Good point. 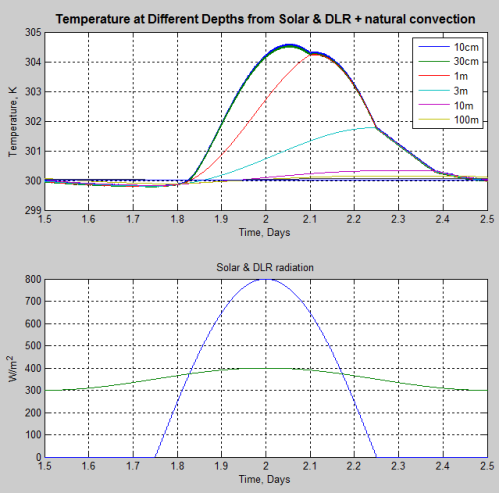 During daytime, when solar is higher, DLR is lower. (DLR should be larger when it is coming from lower/warmer in the atmosphere, but I don’t know much about the radiative properties of clouds.) It still looks like there is enough energy entering the top 30 um of the ocean near noon to “fund” outgoing IR, some evaporation (the rate of which depends on wind speed), and some increase in internal temperature – but the top 30 um is running a “deficit” during the night and some of the day. If I remember correctly, this agrees with observations made in the first article in the reference section. Do you mean proportional to ocean energy? DLR is going to be a product of the T o the atmosphere, clouds humidity etc are going to be factors in contributing to the T, through slowing radiative movement up, but really speaking all that matters is the T o the atmosphere for calculating DLR surly? On average the oceans receive around 235 W/m2 SW, they radiate an average 375 W/m2. So on average, LW is compensating oceanic energy loss by 140W/m2. I showed some day/night temp profiles here. Remember, sunlight doesn’t add much heat to the top 30 μm. It goes straight through. If 235W/m2 are entering, then 235W/m2 must be leaving on average(assuming equilibrium) True enough, its not going to be only going from the ocean surface up radiantly, and it will mostly be transported through convection up in the lower troposphere. But The average T’s will be showing the average energy content of that boundary layer between surface to atmosphere. And its just a useful metric for seeing how much energy is retained/where/why. The fact that radiation cant pass freely through the lower levels o the troposphere, because it is optically thick, so it is absorbed, and heats the lower gases(and increases sea surface T’s, increases evaporation), which excites it, it becomes less dense and it rises. Transporting energy up… this is not a revelation. Now Bryan, the altitude the energy can escape the atmosphere, is going to be a product o the optical depth vrs altitude, yes? So how many opaque molecules per given area, is what is going to set this altitude. Now if you increase the number of molecules, all things being equal;-) it will raise the altitude that radiation escapes the troposphere… requiring a rise in the level o energy at all levels to facilitate the T gradient to allow the energy to be transported to this altitude? Im not sold on CAGW, but i can see what mechanism they are talking about still. There are all sorts o possible variables that come to my mind that could “complicate” things further. Adapt or perish has always been the way o life on this rock anyway. But i will still listen to logic. The convection of air above the water is caused by the air particles being heated by the warmer water by conduction. The hot air rises because it is less dense. Bryan, of course energy is going up, what comes in is going to go out, if 235W/m2 are coming in, it is going to go out, and its going to do it by going up through the troposphere, until it reaches an altitude that it can escape to space through radiation. How it goes from the surface to the lower atmosphere is irrelevant really, if it was all through conduction, the T differential between the lower atmosphere and the surface is still going to limit the energy flow, so that energy is still retained. But it will work to an equilibrium, so that what is coming in is going out. The Wood experiment proves nothing about the interaction of atmospheric radiation with a greenhouse. A glass plate was placed above both the glass covered box and the salt plate covered box to prevent the salt plate covered box from absorbing near IR solar radiation not transmitted by the glass plate cover. So in the LW IR, the salt plate covered box sees radiation from the glass plate, effectively a black body, not the atmosphere. What Wood didn’t do is look at the temperature of the two boxes at night. With a clear sky at low humidity, the salt plate covered box will get significantly colder at night than the glass plate covered box. One surprising aspect of the Woods experiment was the radiative effects of the Earth Surface/Atmosphere interactions were found to be almost negligible. Wood as you say, did not measure night time radiative effects (as far as I know). However the paper below which you recommended did. Especially as it comes from a source with no “spin” on the AGW debate. The way I read the paper is it gives massive support for the conclusions of the famous Woods experiment. As you know the project was to find if it made any sense to add Infra Red absorbers to polyethylene plastic for use in agricultural plastic greenhouses. Polyethylene is IR transparent like the Rocksalt used in Woods Experiment. Double glazing lowers heat transfer to the outer atmosphere by both conduction/convection and radiation because the outer glass plate will be cooler than the inner plate. ….”The principle reason why Wood’s experiment has no relation to the atmospheric greenhouse is that the glass plate will be at the same temperature as the inside of the box because of radiation”……. …. “the net outward IR flux of an IR opaque glass plate is exactly the same as for a transparent, non-radiative salt plate”……. If the IR opaque glass plate was at the same temperature as the surface it would totally absorb the radiation from surface and then radiate itself, half up and half back to surface. Depending on the emissivity and temperature of the glass. Whereas the IR transparent, salt plate would let all the radiation from the surface pass straight through. It would radiate however depending on its temperature and emissivity half up and half down. I gather you you propose that the totally IR absorbent glass plate will have the same emissivity as the non absorbing Rocksalt plate. How does this square with Kirchoff? You gather wrongly. Did you not understand the significance of the phrase “transparent, non-radiative salt plate”? The salt plate is transparent to IR. If it doesn’t absorb, it cannot emit. It doesn’t have to. The flux from the box passes through. With a glass plate, the flux from the box is absorbed by the plate and the plate emits. If you pointed an IR thermometer at each box, it would read the same temperature. The radiative greenhouse effect depends on there being a temperature difference between the absorbing surface and the emitting surface. If the glass plate is close to the temperature of the interior of the box, which is very likely for a small box, then the flux from the outer surface of the glass will be exactly the same as the flux from the inner surface of the box. If you had a very tall box such that the top of the box was much colder than the surface, then it would make a difference whether the top of the box was covered with glass or an IR transparent plate. ….”If you pointed an IR thermometer at each box”…. I would prefer to have a thermometer in the box. Yes I understood it but from the wording in your previous post I was in some doubt if you did. …”The radiative greenhouse effect depends on there being a temperature difference between the absorbing surface and the emitting surface. “….. The half up/half down condition still hold for the absorbing surface I would have thought. This backradiation apparently makes no difference when we compare it to the box with the transparent surface where there is no half back down. The almost 50% extra flux density in the glass covered box apparently makes almost no noticeable difference. 3metres (polyethylene) tunnel or 3Km? Certainly for the IR absorbing poly-tunnel there was very little of the backradiation effect if any. For the 3km tall box case we have no experimental results. However it has been shown that a parabolic reflector can produce ice when pointed at the clear night sky when the ambient temperature is well above zero C.
Situation 1: Parabolic reflector centered on a small glass of water. Earth. Night. Clear skies. Ambient temp = 10C. Mirror pointed toward outer space with no other terrestrial object in “view” (from the water’s perspective). In eight hours, the water cools to -8 degrees C.
Situation 2: Parabolic reflector centered on a small glass of water. Moon Base Alpha. A room with a microgel canopy (10m high) that is transparent to IR but holds an atmosphere of the same composition and temperature as local in Situation 1. Night. Ambient temp = 10C. Mirror pointed toward outer space with no other Lunar or Base object in “view” (from the water’s perspective). How long does it take for the water in Situation 2 to cool to -8 degrees C? More time, the same, or less? Microgel? Is this some kind of superinsulator. I don’t know of its properties. I will answer for the case of a polyethylene structure. On Earth the reflector will concentrate to some extent the rays from the atmosphere at say -30C and transmit at the temperature of the water initially at 10C. the reflector will have very few rays to concentrate and will transmit at the temperature of the water initially at 10C. This would suggest that the Moon case water would cool quicker. The effect will be moderated by the inevitable conductive and convective effects within the structure. Just a comment that I will write a followup article on this, to cover the idea that because convection doesn’t work “upside down” DLR can’t penetrate the ocean. 1. Heat flows are caused by temperature differentials. If more DLR “appears” and adds more heat to the surface then less heat will flow between the deeper level and the surface. Likewise for the reverse case. 2. Convection does work “upside down” because the winds stir up the ocean. During higher winds the temperature differential between the surface and a few meters down is non-existent. At night, due to cooling of the top layer, the ocean also mixes. Therefore, heat is able to be transferred from the surface to the layers below. I just note as well that so far no one has actually offered any experiments or analysis to demonstrate that DLR can’t “heat” the ocean (=”change its temperature). Just their “conceptual model” repeated as “proof”. All for the followup article.